Riding on the strength of their revival of traditional heavy metal on Into the Night, Sweden's Enforcer delivers another metal manifesto with their sophomore release Diamonds. Old school metal is making a well-needed resurrection these days, but it's often hard to pick the 'diamonds' from the sludge. Enforcer is one band, like White Wizzard, that gets it right from beginning to end. Their version resembles more pre-thrash early Eighties North American speed metal like Agent Steel, Exciter or Anvil than the NWOBHM metal invasion. While Diamonds gets off to a shaky start with Midnight Vice, one dog of a tune, things quickly progress for the better. Roll the Dice, Live for the Night, and Katana are songs that race along with giddy metal excessiveness. Then Running in Menace nears catchy radio-friendly extravagance sounding like proto-Sunset Strip sleaze. Even the instrumental Diamonds is inspired, over-the-top, clever metal, with a rock solid arrangement (and some great bass work to boot). Diamonds is certainly a masterful heavy/speed metal frenzy of time. Combine this with the thin, near aluminum paper, production and cheesy cover art and you have the real deal. This stuff is so good, so inspired, and so retro, you may wonder if the Enforcer crew is just yanking our collective chains in metal parody. But Steel Panther they are not, and that's a good thing. Very recommended. 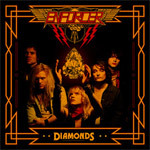 With Diamonds, Enforcer continues on their path of delivering fine retro heavy/speed metal circa 1980 or so. Few in the New Wave of Traditional Heavy Metal are getting it right. Enforcer nails it.